A pergola is a permanent structure that forms a shaded walkway or patio. While it adds beauty and mystique to a home, it is also functional in that it can be serve as protection for an open terrace or serve as an outdoor room for entertaining. It is usually built with vertical posts that support crossbeams. The open area between the crossbeams my be covered with lattice or some type of semi-transparent plexiglass to provide even more protection from sun and rain. 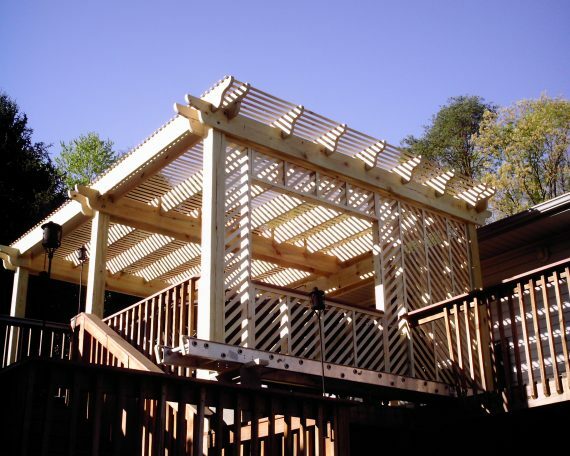 This pergola was built as a shaded extension to the family room, on the deck adjacent to the swimming pool. It serves as a lounging area when the family wants to get out of the direct sunshine, or just a place to relax and enjoy the Tennessee weather. It also provides the owners’ climbing plants a structure on which to grow. The Home Improvement King (THIK) was established in 2002 with the goal of creating a one stop shop for all of your home improvement needs.